With more than two dozen huntable big game species and an astounding array of waterfowl, small game, and birds across a broad range of habitats, Canada is a hunter’s dream. From forests to tundra, from open prairies to vast boreal forests and the stunning Canadian Rockies, Canada has something for every hunter. This sparsely populated country puts great emphasis on protecting its natural resources and provides fair-chase opportunities to pursue magnificent big-game species that pique the interest of hunters from all over the world. Hunting trips to Canada are filled with beauty and splendor and offer even experienced hunters an exceptional challenge and unforgettable experience. 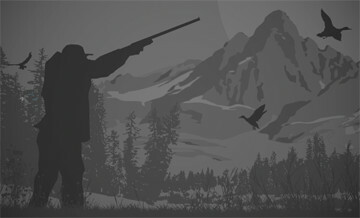 What makes hunting in Canada unique is its rich variety of game: grizzly and black bears, moose, five varieties of caribou, cougar, lynx, Canadian wolf, bighorn sheep, Stone sheep, Dall sheep, elk, black-tailed, white-tailed, and mule deer. If you are looking for a challenge that will leave you with a lifetime of memories, Canada is the perfect destination. Visitors from the USA and most European countries do not need a visa, but Canada does require many travelers to have an Electronic Travel Authorization, which can be purchased online for a small fee before you go. Go to http://www.cic.gc.ca/english/visit/visas.asp to find out which documents you need. Handgun hunting is prohibited in Canada. Centerfire semi-automatic long guns cannot have magazines that hold more than five cartridges. Pump or semi-auto shotguns must have their magazines plugged to hold no more three shells. Visiting hunters must declare firearms in writing to a customs officer at the point of entry to Canada, using the Non-Resident Firearm Declaration (form RCMP 5589).The declaration form should be filled out prior to arrival at the point of entry, in order to save time. However, it should not be signed before arriving at the entry point, as a Canada Border Services Agency (CBSA) customs officer must witness the signature. A confirmed declaration costs a flat fee of $25, regardless of the number of firearms listed on it. It is valid only for the person who signs it and only for those firearms listed on the declaration. Once the declaration has been confirmed by the CBSA customs officer, it acts as a license for the owner and it is valid for 60 days. The declaration can be renewed for free, providing it is renewed before it expires, by contacting the Chief Firearms Officer (call 1-800-731-4000) of the relevant province or territory. To avoid problems on their return to the USA, American hunters should have in their possession a U.S. Customs Form 4457 listing their firearm and its serial number. Wildlife management in Canada is handled on a provincial basis. Each province has its own hunting rules and regulations, and even within a particular province, hunting styles as well as gear and clothing may differ widely. Most outfitters can be relied upon to provide a list of recommended gear and clothing, as well as suggestions for firearm types and calibers. 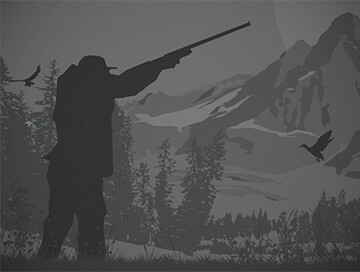 Stand hunts, for example, often call for heavy, warm clothing, while hunters venturing to the mountains or taking on strenuous spot-and-stalk hunts should dress in layers. Comfortable boots appropriate to the terrain are a must for any hunt. Some provinces require hunters to wear a fluorescent orange hat, vest, or sometimes both. Some provinces require all nonresident hunters to hunt with a guide-outfitter; others do not. In general, most provinces in western Canada require the service of a guide-outfitter, while a few in the eastern part do not. All hunters, however, must have a valid hunting license for the province and, if required, a valid permit or tag for the species they are hunting. In order to purchase a hunting license, you may be required to show a valid hunting license from your state or country and/or proof of having passed a hunter education course. Discuss these requirements with your outfitter prior to the hunt. The largest variety of big-game species are available in the western provinces of British Columbia and Alberta, which encompass the Canadian Rockies and hold bighorn sheep, mountain caribou, elk, mule deer, mountain goats, bears, wolves, and many other highly sought-after species. British Columbia and the Yukon are the only places in the world where Stone sheep are found. The Yukon Territory and the Northwest Territories hold moose, Dall sheep, and central Canada barren-ground caribou. In the far north, Nunavut is the destination for muskox, polar bears, and caribou. The provinces of Saskatchewan and Manitoba, with their prairies and forest regions, are well known for whitetails and big bears, and farther east, whitetails and black bears are also found in Ontario. Quebec and Labrador are major destinations for caribou hunters, and the Maritime Provinces, especially Newfoundland, offer high-success hunts for moose and woodland caribou. Tipping is expected and appreciated on most hunts in Canada. Tips generally range from 5 to 15 percent of the total hunt cost. American hunters may, in most cases, bring wild game meat and trophies back into the USA, provided it is accompanied by the appropriate licenses and declared for inspection by USDA officials at the border. Game birds and waterfowl being imported to the US as trophies must be processed at a taxidermy shop approved by the USDA. For details, contact the USDA Animal and Plant Inspection Services National Export and Import Center at 301-734-3277. All hunters should also be aware that certain animals such as black, grizzly, and polar bears require CITES permits and, in some cases, additional export permits must also be purchased for certain animals. Check with the province you are hunting in to ascertain costs and requirements. The USA does not allow the importation of polar bears.